This streak is a crack that has developed in the front windshield. 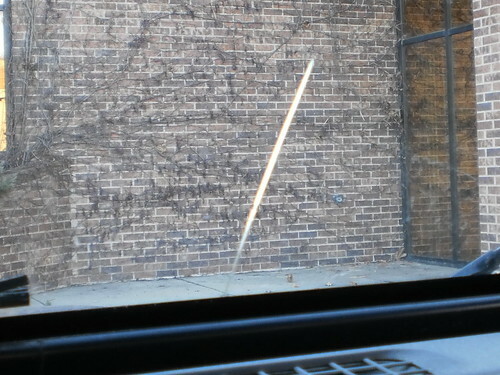 Out of site, there is a spot at the base of that crack where the frame surrounding the window is crumbled and rusted. I'm sure that has something to do with the crack. Add the stress of it being warmer on the inside of the car than the outside and I'm not that surprised something like this has developed. I expect it to go all the way to the top of the window. It's not annoying, as you can see, it's a straight line, but it means yet another thing needs to be fixed on the Jeep. I need a new car but I am far, far from being able to afford one, even a used one. I have to make do as best I can. And, I really like driving my Jeep. It's been a huge amount of fun over the 10 years that I've had it. The thought of getting a car I have to get down into also doesn't sit with me, not now. I would probably be in tears some days at the prospect of having to stand up when I get out of the car. For all the problems with the Jeep that I have, I merely swing my legs out the door and slide to the left. When I do have to replace this car, I will miss it, a lot. For now, I will make due, patch and continue.